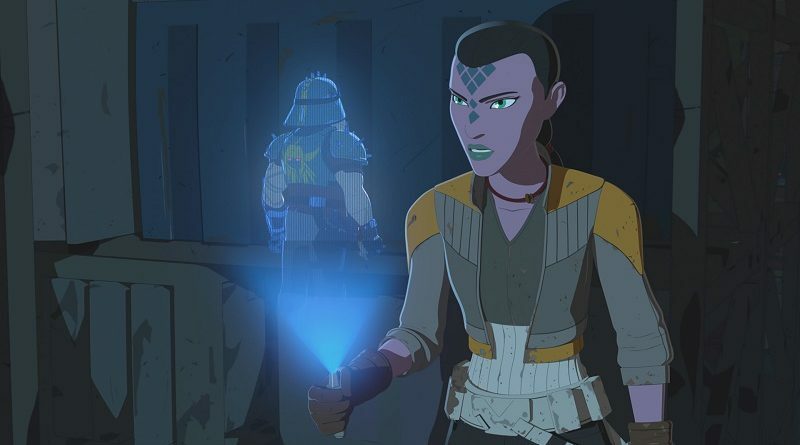 Remember Star Wars Resistance two weeks ago, when we watched Synara and Kaz begin what should have been a marvelous few scenes of spy versus spy in “Bibo”? Instead, hope for those scenes literally was overshadowed by the sudden arrival of a leviathan prepared to tear the Colossus down to its struts in the search for its smelly offspring. Fortunately in this week’s episode, “The Doza Dilemma,” we finally get the chance to observe one spy hunting after another – and only one flattened toe or two in the process. 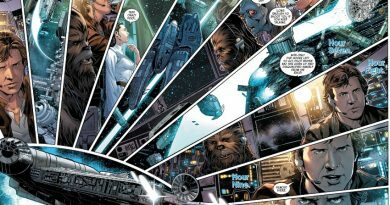 Also featured in this week’s episode of Resistance is more First Order/pirate intrigue, which, as we already know, is the pathway through which the First Order intends to become a permanent fixture on the platform. At the heart of “The Doza Dilemma” is Synara, the purple-skinned Mirialan pirate who tricked her way onto the platform via the lizardmonkey heroics of Poe Dameron and Kaz Xiono. Ever since her arrival, she has quickly become one of the more interesting characters on the show, which is a good and bad thing. It’s good because she represents a woman given attention by the writers, but it’s also unfortunate because it’s coming at the expense of the other women characters on the show. Even more, it’s an alien woman taking over the spotlight from women representing African-American and Latinx ancestry – and in representational terms, an alien character is never a suitable substitute for a person of color. Also regrettably, it often seems like merely the fact Synara is a woman is what draws Kaz’s attention to her and detracts from his spying abilities. The dilemma in this episode arises from Synara’s own conscience. It builds slowly, as Synara is willing to work against the best interest of the people of the Colossus for the sake of her original mission. Without realizing their intentions, she agrees to help smuggle in two more pirate comrades and to get them access to Captain Doza’s gleaming tower. But she cannot ignore the friendliness of Torra Doza, Tam, and Kaz, who invite the purple pirate into their circle of friends; and in particular, Torra’s own trusting action to bring Synara into the tower to her room and provide her with her own personal access code. That Synara ends up abusing that trust to gain entry for her colleagues is a nice touch in depicting how torn she is between her two loyalties. When push comes to shove and Synara learns that the plan is to kidnap Torra, however, she takes active steps to try to prevent her pirate family’s greedy ambitions from endangering her newfound friend. Meanwhile, Kaz’s suspicions are raised, finally setting into motion the spy drama that had been ripped away by the inconvenient sea monster. Buoyed by a romantic interest in Synara, he makes a late night visit to Synara’s workplace right as Synara is ushering her pirate friends from a smuggled container to the corridors of Captain Doza’s domain. From the shadows Kaz follows quietly, at first concerned that Synara is a victim, not a collaborator with the suspicious individuals. 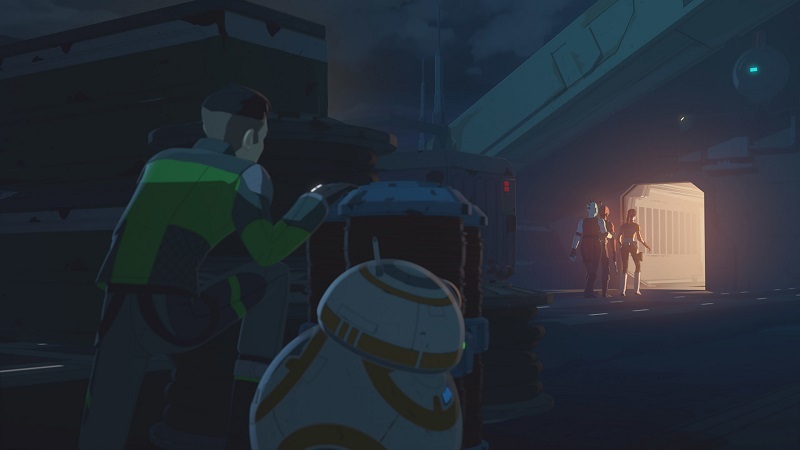 This concern shifts over the course of the episode until a tension-filled conversation at the conclusion, where Kaz admits to BB-8 that he realizes Synara is either an agent of the pirates or worse, a pirate herself. Here both the animators and Christopher Sean bring a touch of remorse to Kaz’s realization. Coincidentally, though Kaz has made a correct analysis of the situation, Synara herself appears not quite so certain where her allegiances lie anymore. In a conversation with her pirate captain, after he tells her the First Order had betrayed them, she responds, “Where does that leave me?” Before she – or the audience – gets an answer, the conversation is cut off by Kaz arriving. Undoubtedly, the answer will become critical for Synara’s future on the platform, as well her place among her new (and former?) friends. Since “The Triple Dark,” Resistance’s third episode (second to air), the pirate/First Order coalition has existed as a key element of the First Order’s designs on the Colossus. Until this episode, the pirates served as the First Order’s proxy, continually providing the threat to the platform that would give the First Order reason to deploy its soldiers there. The kidnapping of Torra Doza seemed perfect to strike fear of the unpredictable into Captain Doza – enough so, that he would hand over the keys to the platform to keep his daughter safe. As Star Wars themes go, doing terrible things to protect loved one is pretty on the mark. However, “The Doza Dilemma” pulls a twist on the viewers by having the First Order immediately turn on the pirates and rescue Torra themselves. Somewhere a Centrist politician is just dying to have video footage of the brave First Order saving victims from the cruel hands of pirates as proof of the benevolence of the Empire’s newest incarnation. In this case, it results in the First Order getting a toe in the door by providing complimentary stormtroopers to help keep Torra Doza safe. Undoubtedly feeling indebted to the First Order, Captain Doza can barely attempt a refusal before giving in. “The Doza Dilemma” is finally starting to cash in on the credits Resistance has been stacking up over the past half season. The First Order has a foothold on the platform, the pirate storyline is coming to a head, and Kaz is pulling off the actions of someone who’s capable enough to be a New Republic ace star pilot. (All right, Kaz still gets dinged for this episode’s moment of Kaz-ness: missing every target in the blaster game in Torra’s quarters, then claiming he can shoot better with a real blaster – we saw you in “Theta Station Black,” you can’t hit things with a real blaster, either, Kaz!). It’s a bit of a broken record here, but the animation maintains its superb quality for a 20+ minute television show. One key of the animation is the dedication to light and shadow, something introduced in The Clone Wars and carried over into other Star Wars projects ever since. By the end of “The Doza Dilemma,” we are left wanting more, a lot more, and in a good way.